I have the new rear wheel set for my new Catrike 700 but I'm still waiting for the new Catrike 700 frame set which I have dubbed "Red" to distinguish it from my current performance 700 which has been dubbed "Black". I wanted a rock solid rear wheel set that can be loaded, abused and take me anywhere without worry. Weight - Total weight 6.8 pounds (3084g). The beefy Marathon Plus and tube account for 2.3 pounds (1050g). I'm setting up a new Catrike 700 to replace my Catrike Expedition. So I'm selling my Catrike Expedition frame. Click here for information or click on the FOR SALE tab on the title bar above. Johnny "Rocketman" Williams recounts the story that let to his decision to drop out of the Trans Am Race at the Bent Rider forum here. "I walked across the street to an small medical clinic where I was promptly informed their not an immediate care facility. They asked what was wrong, however, and had a nurse check out my pulse/bp. Within the next minute, they had called 911 and within three minutes I was on an 80 mile ambukance ride to the nearest large medical facility in Rexburg, Idaho. Throughout the 90minute drive, my heart would 'convert' between rhythms...150-160 and then back into the 60's." 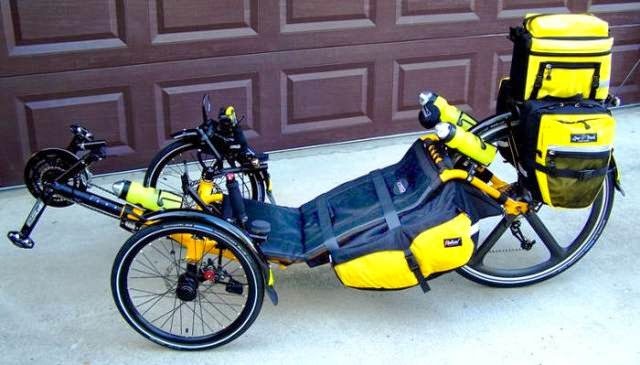 I ordered a new Catrike 700 frame set and I'll be setting it up for comfortable cruising and touring. 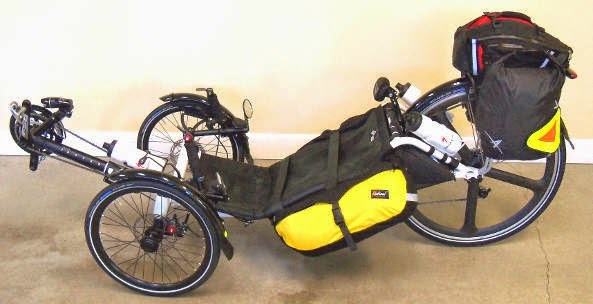 After seeing some other trikers set up their 700's for touring I decided that a 700 can indeed be a great touring trike. First let me say...I still stand by my comparison of the Catrike 700 to the Catrike Expedition for the average casual rider and first time rider. But the new version Catrike 700 with 20" wheels and it's modified frame is proving it's worth as a touring trike for the serious rider. In addition things have changed for me personally so I'm replacing my Expedition with a 700 set up for cruising and hopefully some light touring. The new 700 "Trucker" as I call it (named after the popular Surly Long Haul Trucker touring bicycle) will sit beside my other 700 that will kept light and fast. In September of 2013 I had my left hip replaced followed by a replacement of my right hip in December of the same year. Though the pain in the hip joint is long gone the muscles of the hip will need some more time to recover. They're still tight from scar tissue and I still have some occasional foot numbness when standing too long. Measured on a weekly basis (maybe better to say a monthly basis) final recovery is progressing well. In addition the entire leg takes a big hit from hip replacement and it'll take time to work out the stiffness in my leg muscles and regain their strength. My rides are now up to 20 miles and I avoid riding two days in row. Since September I've put close to 1,000 miles on my 700 breaking in my new hips. My Catrike Expedition as seen very little time on the rode. Needless to say I've spent a lot more time on the lighter and quicker 700 so as not to stress out the hip recovery process by riding the heaver Expedition. When I do take the Expedition out my hips are a little more sore then after rides on the 700 (lately after my 700 rides I'm no worse for wear). Over time I figured out that seat angle of the Expedition, more then the extra weight, is putting extra stress on hips. Not a lot but just enough to be noticeable. I've become very comfortable with the 25 degree seat angle on the 700. In comparison to the 37 degree angle of the Expedition I find the lower seat angle easier on the new hips and it seems I can breath better (torso straighten out more) and I can exert more power to the pedals in a more reclined position. 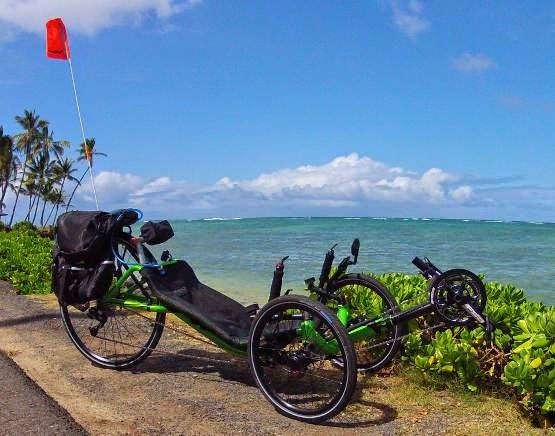 Practically speaking the new Catrike 700 with it's 20" wheels, slightly higher ground clearance then the old 700, stretched out frame and it's low center of gravity can be morphed into a safe and comfortable long distance trike with mindful component selection. I have also come to appreciate the narrower width of the 700 compared to most other trikes. The inch or two less on the width has made a big difference for me when transporting the 700 and negotiating some tight pole barriers on some paths I sometimes ride. Other trikers Catrike 700 setups. 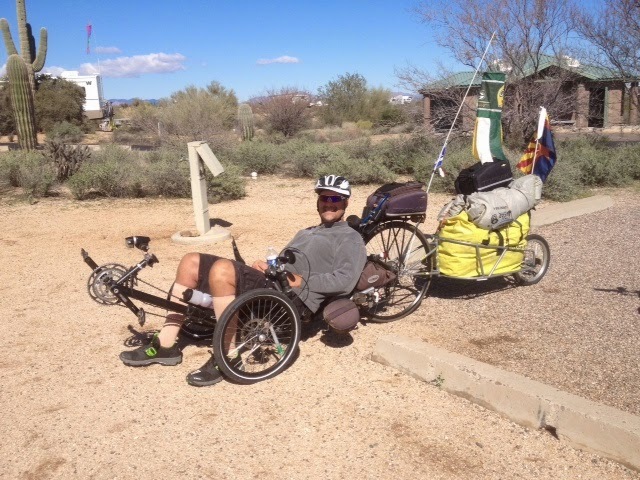 Steve's Catrike 700 here at his Trike Asylum website. Gary's 700 here at the the "Rider Stories" page on Trike Asylum. Jame's 700 here at the the "Rider Stories" page on Trike Asylum. I wish I had this picture to share when someone asks "does your neck hurt from holding it up while riding a recumbent?". Um mm...about as much as it hurts sitting in a recliner watching television..
Another reason to ride bent on long distance races. 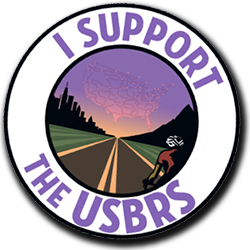 From: Ultra Marathon Cycling Association. "Michael Shermer grudgingly gave his name to this malady during the 1983 RAAM on his approach to Harrier, IL, nearly 2,000 miles into the race. His head felt heavy and the back of his neck was increasingly sore. He described it as, "a quick melt down." His head dropped, making it impossible for him to look up. Cradling his chin in the palm of one hand with his elbow on the padding of his aerobars, he supported his head well enough to finish the race. Despite excruciating pain during the event, his neck was back to normal within two days. In the 21 years since Shermer experienced the first reported case of Shermer's Neck, countless other ultra-cyclists have had the same problem. Shermer's Neck typically starts between 300 and 1,000 miles into the race. In all cases the onset is sudden. From the time of first pain and weakness, the neck usually gives out within two to three hours. Symptoms always start in the back of the neck. The head feels heavy and the cyclist can't look up without assistance from a mechanical device. Once a cyclist gets Shermer's Neck, it is unlikely to leave for the remainder of the race. The SCM attaches to the skull behind the ear and plays a role in supporting the head. 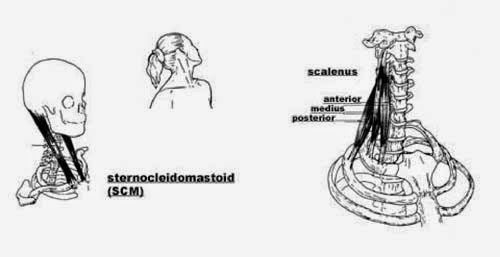 There are three separate scalene muscles that run beneath and behind the SCM and perform a similar function. In an extreme cycling position the scalene muscles may be in strong contraction while extending the neck. These muscles are not accustomed to prolonged, sustained work when the head is in an aero position during a long race." Doesn't sound like much...20 miles but it was my first ride over 15 miles for some time now. 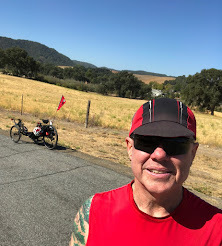 The last 20 mile I pedaled was a few months ago while I was still on pain killers for my hip replacements. That ride was easy enough thanks to my little friend hydrocodone. But I paid for it later in the day with considerable soreness and a reprimand from my doctor. Today's ride was exactly 20 miles with 903 feet of gain (no steep climbs). I rode at a relaxed pace and averaged 14.0 mph. At the end of the ride I felt good and feel like I can do more as long as I don't push the pace. Beautiful day to start pushing the miles. Currently there are two races crossing the country, the well established RAAM (Race Across America) and the inaugural Trans Am Bike Race. 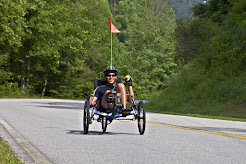 In both races recumbent cycling is represented. I enjoy tracking both races but I am hooked on the Trans Am Bike Race. It captures the spirit of not only adventure cycling but cycling in general. The RAAM is comprised of racers who have qualified via other races and distant events. It requires a substantial investment and is heavily supported by team personal and follow vehicles. It represents the ultimate in long distance racing and is a fantastic event to follow. It is a race pure and simple. 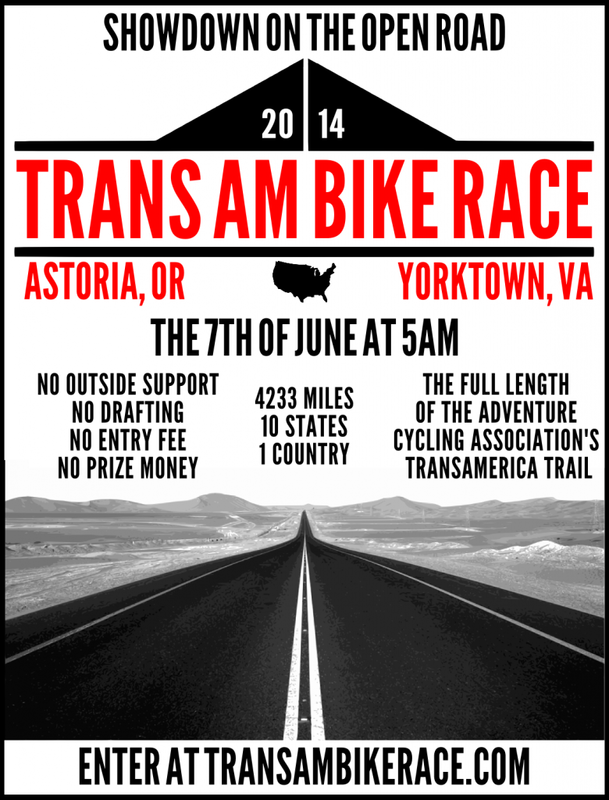 On the other hand the Trans Am Bike Race is a race but at it's core is adventure. It's an adventure that every cyclist can dream of participating in, all that's needed is the will and the legs. Anyone can race and the investment is small and the prize is huge...bragging rights. Support is prohibited, no help from friends or family. It's a lonely 4000 miles. The basic rules are simple you start and you finish and no support in between except for what any racer can commercially pick up along the way. Although the route is mapped out the official route is the shortest possible route between the start and finish. The Trans Am Bike Race represents the true spirit of cycling. 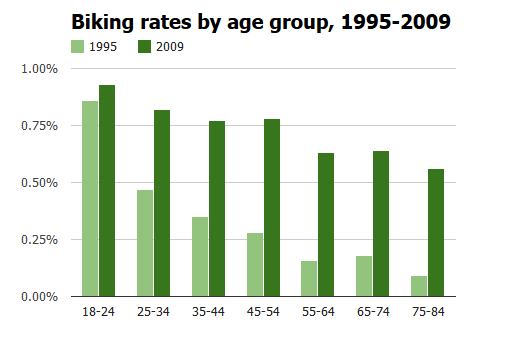 What cyclist hasn't felt the cool breeze in their face and wished they could ride on forever. I have and maybe someday I will, when my body stops breaking down on me. For now I'll ride vicariously with an eclectic group of cyclists racing across country with nothing but sky above and their thoughts to guide them. Some of the Trans Am racers may not be the fastest and some not the youngest but they're all out racing for the adventure and the prize. Follow Johnny Williams "Rocketman" on the Trans Am Bike Race here (my post with links). The Trans Am Bike Race started early this morning. Bent rider Johnny Williams aka Rocketman started out strong on his Gold Rush. Check for updates and information by clicking on the Trans Am Bike Race poster in the right hand column of my blog or click here. In addition to some earlier modifications I made on my Expedition (Expedition Upgrades) I recently lightened up the Beast, installed a new Tubus Logo Evo rear rack and tweaked the front derailleur mast. I also run 1.35 inch Schwalbe Marathon Plus tires on all three wheels (front 35-406 and rear 35-559). They make a noticeable difference in the handling and speed compared with the old 1.75 inch Marathon Plus tires I had on before. These are nice tires and I'm not sacrificing puncture protection for better performance. I eliminated the trunk bag and now I put my daily ride stuff in the side bags with plenty of room to spare. I usually ride with the Ortlieb panniers so I can stop and pick up some groceries or whatever while on my leisurely rides with the Expedition. I also eliminated the boom bag. It was just a place to put junk I didn't need on a day ride. Rear view of the Tubus Logo Evo (link to Bike Bag Shop) rack. The side rails of the rack lean inward at the top bringing the load (in my case groceries) closer the center line of the trike for better stability. With my old rack the panniers would lean out at the top when loaded. The panniers are mounted low on a secondary bar. The lower mounting position allows for the load to be carried lower and more stable. The top platform of the Evo is narrow and doesn't work well with most trunk bags. Most trunk bags may wobble a bit. I solved that problem by simply realizing I don't need a trunk bag. Now's there room to lash down another bag or two like an Ortlieb Rack Pack (link to Bike Bag Shop) on top of the rack. The Evo is rated to carry 88 pounds (40kg). The Tubus installation is easy. The attachment bars can be ordered in different sizes. The clamps on the seat bar are from the Hostel Shoppe. Not only have I reduced the weight of the Beast I think it looks better. My view from the picnic table at the park. On the post is a barn owl nesting box. I also tweaked the derailleur mast to better accommodate the MTB crank I use on the Beast. I had to grind off the cable stop to allow the derailleur to slide down the mast to line up better with the smaller size of the MTB chain rings. I added a "clamp on" cable stop lower down on the mast. The "clamp on" cable stop needed a little machining to get it to line up better with the derailleur. It's not perfect but it works well, for now. I use a MTB crank to get lower gears for climbing without using a mechanical drive such as a Schlumph Mountain Drive. BTW - This is how to fully load a Tubus Logo Evo rack. Just throw stuff on it. SOLO Riders Start June 10th. 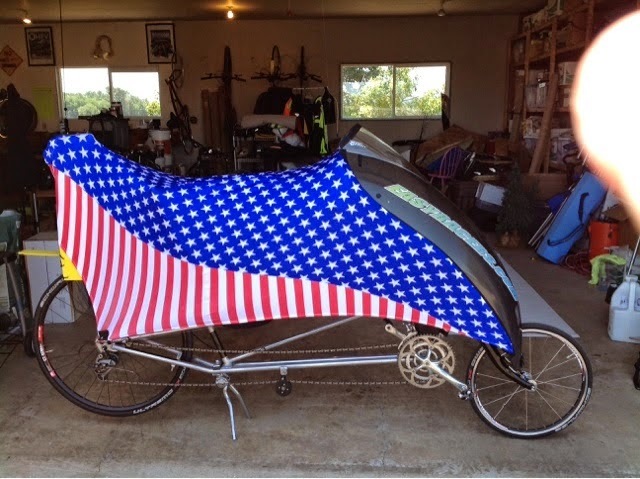 Jacquie Schlitter will racing in the RAAM with four different recumbent brands. It "may sound unusual but perhaps it’s not as risky as I first thought. According to Team Jac Attack, Jacquie is wickedly fast on all of them. Having four different bike choices will give her a lot of latitude if any comfort issues come into play. That’s my theory anyway. It will be fun to watch how the four-bike option plays out." - RAAM Leader board here. - Live tracking via Tractalis here. Jacquie has many links. I'll put them all up in order of what seems relevant. - Jacquie's RAAM Facebook page here. - Jacquie's news page here. - Jacquie's personal Facebook page here. raffling off five different recumbents. - "3000 Miles to a Cure" Facebook here. 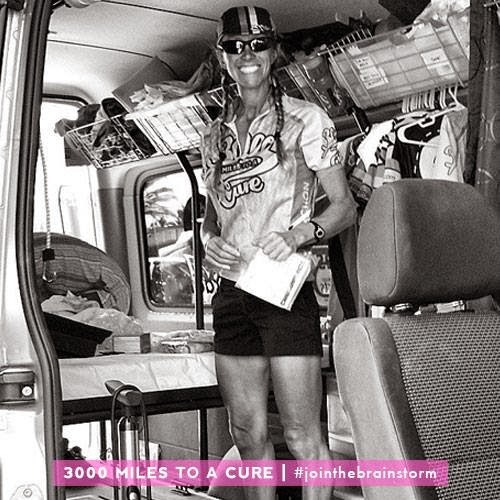 - Jacquie's "3000 Miles to the Cure" webpage here. Reposted from RAAM Facebook page here. "Jackie is ok. Mother Nature won this round. The winds in Kansas took too much out of her. She had to dig so deep to make the Mississippi cutoff. I screwed up the the recovery sleep plan and it left us in the hole. This make it difficult to to take advantage of the Illinois and Indiana friendly terrain where she could have let it rip. It came down to killing herself to get close or be smart and pull the plug. Life is too short to take too far. As for the bike drawing we will talk with Maria Parker tomorrow and let everyone know the plan. Jacquie is so grateful for everyones love and support." RAAM race video. Jacquies segment starts at minute 1:30 and ends at 5:54. Jacquie is off. Watch her start. "I have just the most incredible group of caring and supporting individuals here, just very lucky. And we're here to support 3000 Miles to a Cure which is a brain cancer research charity that Maria Parker started last year during her RAAM. My goal is to continue to raise funds for this charity. It's very important and dear to my heart. My husband lost his sister earlier this year and Maria's sister is still struggling with brain cancer right now."